Louisiana Voodoo, also known as New Orleans Voodoo, describes a set of underground religious practices which originated from the traditions of the African diaspora. It is a cultural form of the Afro-American religions which developed within the French, Spanish, and Creole speaking African American population of the U.S. state of Louisiana. 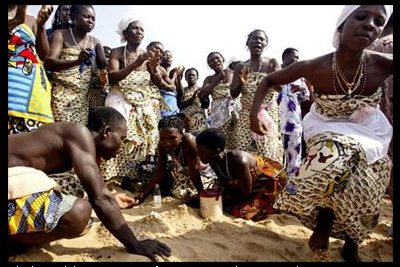 It is one of many incarnations of African-based religions rooted in West African Dahomeyan Vodun. They became syncretized with the Catholicism and Francophone culture of south Louisiana as a result of the slave trade. Louisiana Voodoo is often confused with (but is not completely separable from) Haitian Vodou and southern Hoodoo. It differs from Vodou in its emphasis upon Gris-gris, voodoo queens, use of Hoodoo occult paraphernalia, and Li Grand Zombi (snake deity). It was through Louisiana Voodoo that such terms as gris-gris (a Wolof term) and voodoo dolls were introduced into the American culture. Voodoo was brought to the French colony Louisiana through the slave trade. The core beliefs of Louisiana Voodoo include the recognition of one God who does not interfere in people’s daily lives and spirits that preside over daily life. Spiritual forces, which can be kind or mischievous, shape daily life through and intercede in the lives of their followers. Connection with these spirits can be achieved through dance, music, singing, and the use of snakes, which represent Legba, Voodoo’s “main spirit conduit to all others.” Unlike the Judeo-Christian image, the Voodoo serpent represents “healing knowledge and the connection between Heaven and Earth.” Deceased ancestors can also intercede in the lives of Voodoo followers. The main focus of Louisiana Voodoo today is to serve others and influence the outcome of life events through the connection with nature, spirits, and ancestors. True rituals are held “behind closed doors” as a showy ritual would be considered disrespectful to the spirits. Voodoo methods include readings, spiritual baths, specially devised diets, prayer, and personal ceremony. Voodoo is often used to cure anxiety, addictions, depression, loneliness, and other ailments. It seeks to help the hungry, the poor, and the sick as Marie Laveau once did.